No time to plan, no musical subs, and NO rest for the voice! These are the woes – among many others (no respect, anyone?) – of the general music teacher. Now you have high quality content from an experienced professional anytime you need it. Introducing The Music Teacher's Engagement Library! Turn it on when it fits, then turn it off! One click opens a world of over 40 interactive folk song videos, instrument demo’s, how-to lessons and full-length concerts from an acclaimed professional teaching artist. "My sub loved it too"
12 months of unlimited access - for less than the cost of a classroom rug! * A private online concert just for your school! Get ready to move, laugh, smile, and sing! What's included in the library? 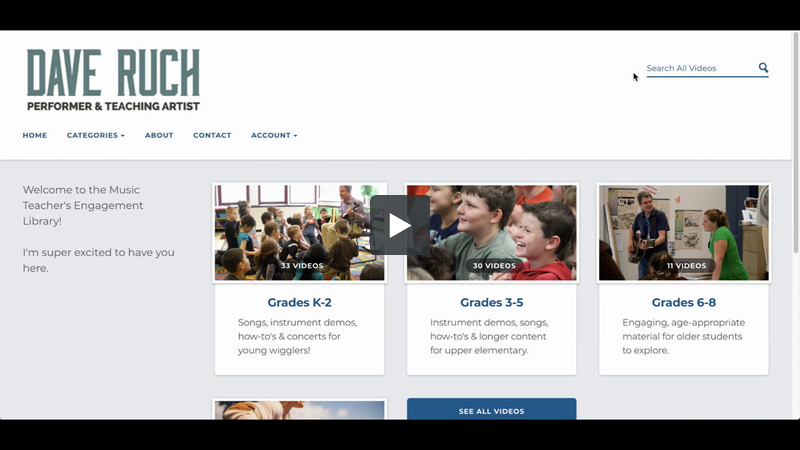 The Music Teacher’s Engagement Library contains 41 proven videos for K-8 students. 7 professional development videos – learn to play guitar, spoons, and hambone! Each video is indexed by grade level, searchable by keyword (“counting,” “Native American,” “call and response,” etc. ), and labelled with cross-curricular tie-ins for collaborating with classroom teachers. Can we see a sample? There are two videos from the library posted above, but DON’T just preview them – use them with your kiddos to see first-hand how they respond to this format. See the pricing section above – – my goal is to keep this as affordable as possible, so for less than the cost of a classroom rug or one tiny assembly program, you get 12 months of videos and lessons and a wealth of content for days when you can’t teach. I teach in multiple schools - how does that work? Going from building to building is difficult enough, so this is real simple. There is no extra charge to use the library in multiple locations as long as you (or a sub) are the teacher using the videos. If multiple teachers in your district would like to be using the library, there are volume discounts for that – just select that option on your order form. Dave Ruch is a Buffalo NY-based performer and teaching artist who has been extensively involved in the arts-in-education field since 1995, using music to teach core curriculum and inspire young learners. Through school assemblies, workshops, residencies, and distance learning programs, he works with tens of thousands of students each year in preschool, primary, elementary, intermediate, middle and high school settings. Ruch is also a Public Scholar for the New York Council for the Humanities and a contributor to the Huffington Post. His work has been featured on American Public Radio, NPR, PBS, and CBS Sunday Morning. Enrollment for paid subscriptions is open! Accepted payment methods – – credit card, school check, or purchase order. Just click “Buy Now” to be taken to the order form and select your ideal package.